A house full of tradition in the middle of nature and nonetheless not far from the beautiful village centre Oetz is awaiting you. We offer spacious roomscomfortable halls, wellness area and facilities for children. Our house is the right address for a perfect family holiday as well as an unforgettable sports, nature and hiking holiday. "Grüß Gott" as we say in Tyrol - Welcome! Located on the 1st and 2nd floor of the main house. Our classics include a living room / bedroom, shower / WC or separate WC, cozy sitting area, wardrobe and most with balcony or terrace. Flat screen TV, high speed wireless internet, radio, hair dryer. Pure feel-good room in a modern, alpine look. Located in the main house (1st floor) and in the dependance and about 30m2 in size. With living room, shower / WC, beautiful stone pine furniture, comfortable seating area, natural floors and balcony or balcony terrace. Flat screen TV, high speed wireless internet, radio, telephone, hairdryer. Much, lots of space for up to 4 people. Approximately 48 m2 large living unit with generous, designed in solid pine wood bedroom and a large Zirbenstube with seating area and extra-wide sofa. Shower / WC separate, balcony, flat-screen TVs in every room, high-speed Wi-Fi, radio, safe, hairdryer. Approximately 35m2 large and located on the 1st and 2nd floor of the main house. With living room and additional children's room, large shower / WC, sitting areas, flat-screen TVs in every room, high-speed Wi-Fi, radio, safe, hairdryer. The favorite room for the spoiled. Approximately 34 m2 and located on the 1st floor of the Dependance. Large living room with comfortable double bed and a comfortable couch in the bay window, which also provides sleeping space for two more people if necessary. Shower / WC, balcony, high-speed Wi-Fi, flat screen TV, radio, safe, hairdryer. The prices are valid per person and day and include our generous breakfast sideboard with a lot fresh products from our domestic agriculture as well as 3-usual evening menus with option including (daily 3 different menus, from that one’s vegetarian for the selection!) inclusive daily fresh salad sideboard. 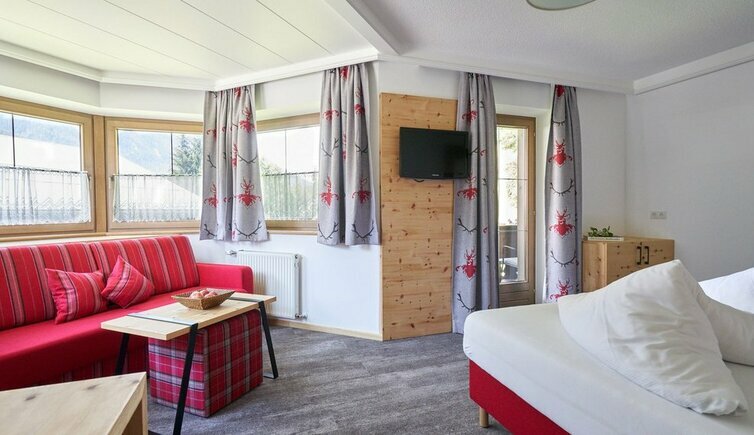 Included are furthermore: The using of our new Sauna- and BaederLandschaft, our fitness room’s, the child furnishings’ as well as a gala dress dinner and a welcome evening. Pets: Domestic animals are allowed in the Jaegerhof (except for in the dining-room). Cost € 15,- per day without food. Excellent winter sport hotel. Awesome vibe. Oetztermühlerweg 6 - A - 6433 Oetz 771 m a.s.l. 3 or 4 days including feel good half-board (Half board with a generous breakfast buffet, plenty of fresh products from our own farm and 4-course dinner menus). Even the little guests want to go up high. With our Happy Family offer, both parents and children benefit from varied and adventurous vacation days. 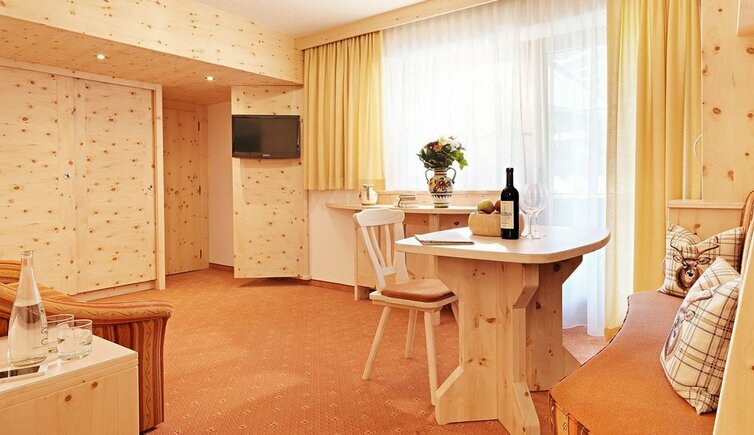 Hotel Jägerhof (Oetz) is responsible for the content of this page.